I’m normally one to resist planning Christmas out or decorating before Thanksgiving, but this year I’m already thinking ahead to Christmas, and more importantly the Advent season. (Affiliate links are included in this post. For more information, see my disclosure page). I have shared a little bit about what advent means in a different post, but it really doesn’t matter what you call this time in December. It comes down to this one thing. We must be carefully preparing our children to celebrate the true meaning of Christmas, instead of letting the busyness of the season steal away their hearts. The true meaning of Christmas is not about Santa Claus, gifts under the tree, yummy food to eat, holiday movies, and family gatherings. It’s about remembering the birth of our Lord and Savior, Jesus Christ. I like to take it a step further and constantly remind my children as we talk about his birth in December, that without this birth taking place, there could have been no death, no resurrection, or salvation for our souls. As parents we actually have been given a tremendous opportunity to help our children understand more about the great sacrifice that Jesus did on our behalf through Christmas. You don’t have to wait until the week of Easter to go over this, it naturally fits into the month of December if you celebrate advent all month long. So with that being said, I’m going to share resources that will make it easier for you to do this in your home. I know the month is so busy, and the last thing I want to do is create my own month long study to do with the children. Using an Advent calendar is probably what most people do, but so many times the advent calendars are not centered around the Lord now. Lego calendars, playmobil calendars…really anything you could think of is available. I’m not saying these are all bad, we did a girl’s Lego calendar last year as a fun side thing, but we always focus on a religious advent calendar, and if we do something fun it’s the side thing. We have used this fabric advent calendar for a few years now, and the children love taking turns pulling out the daily figure and building the nativity scene throughout the month. Of course I always put baby Jesus last, so he is the final figure put up. This year I’m looking at getting these advent cards for children. They look beautiful, and they have different questions on them depending on the age of your children. We could hang them up on our mantel, or somewhere in the house, or use this amazing pocket calendar if I wanted to invest in it. I have meant to use the Birth Of Jesus study by Grapevine Studies for several years now, and just never made it happen. I’m hoping this is the year we do this. Nativity Advent Coloring Page –This is good for toddlers! 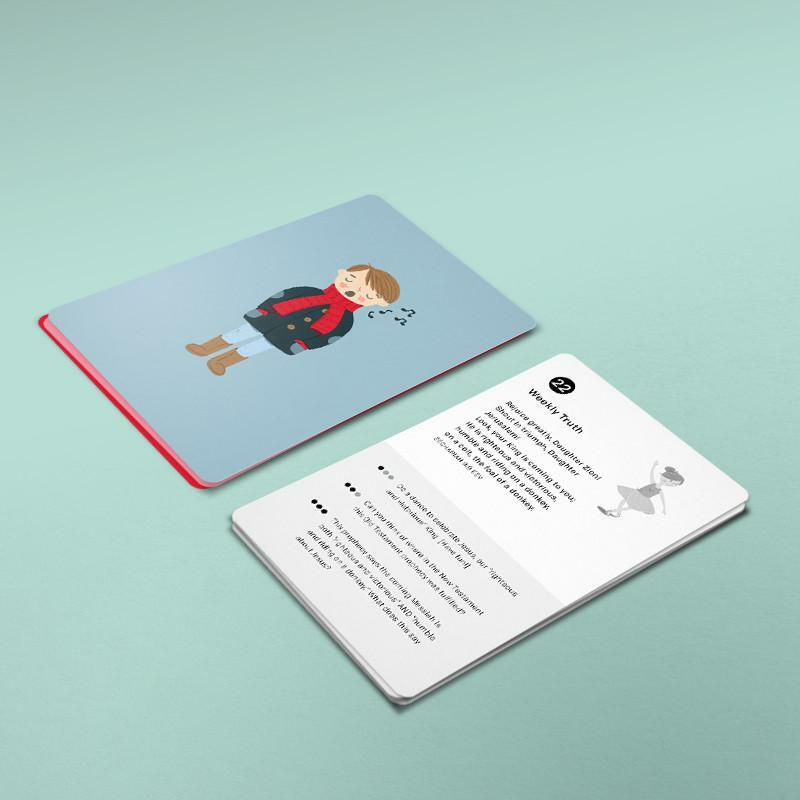 Printable Advent Calendar Cards – this one focuses more on advices to do as a family together. Names of Jesus Advent Calendar – You could put this in a traditional advent calendar, or just print off and use as part of a morning devotion. Nativity Finger Puppets – let your toddlers use these as you do daily devotions. If you want to do a fun advent calendar as well for your children, here are few that stood out to me! 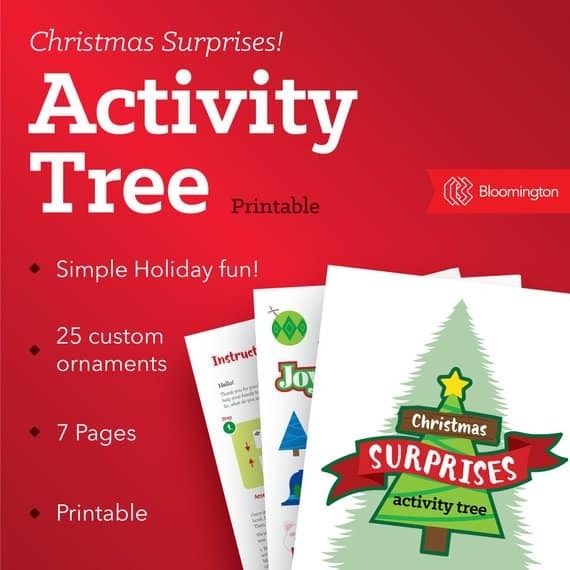 Christmas Tree Activity Printable – Sean created this one, it’s a fun way to let children put ornaments up on a paper Christmas tree, and then look at the paper included and find the symbol of that ornament and see what it says to do that day. It’s simple things like driving out to look at Christmas lights, drinking hot chocolate as a family, or watching a Christmas movie together. I hope this gives you some ideas as you start thinking about preparing for Christmas with your children! Don’t go away yet though! 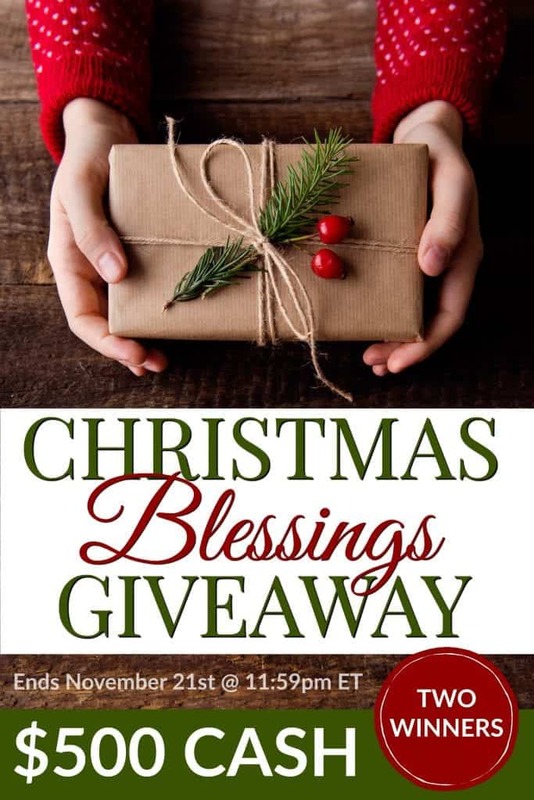 With Christmas being the season of giving, I’ve gotten together with some pretty awesome bloggers to give TWO families some CASH in the 5th annual Christmas Blessings Giveaway – $500 cash (delivered via Paypal). With an extra $500 I would be able to bless my husband and children much more this Christmas! As a single mom, the holidays are exceptionally hard. This extra $500.00 would go far to make my sons Christmas something memorable instead of getting just the essentials of toiletries and clothes. I would use this money to add to our vacation fund! Entering the giveaway! We are trying to save up enough money to complete the adoption of our baby girl, due in December! $500 right now would be a huge blessing for us! We would use this money to bless others at Christmas. Our church has a Christmas Shoppe for those who can’t afford gifts for their children. I would be able to bless my kids, husband and our extended family in a big way!! We LOVE being generous, especially at Christmas time. Much of this would likely also be used to buy food to donate to a local food pantry as well. What a great holiday blessing for someone! I would buy clothes and shoes for my 6 sweet children. Thank you for the drawing! We could pay bills with the money. I would use the money for Christmas gifts, after I paid a bill! This would be a huge blessing! I would use this to bless the children I work with, and their families, as well as my family and coworkers. Money is too tight for me to be able to give as I wish I could, even the smallest would help! Awesome giveaway!! I would use the money to help support our growing family! #3 is due on Christmas Eve!! If I won the $500 I would use it to pay our elderly grandparents (2 sets) electric bills for the month and provide them with some much-needed groceries. Since my husband has been out of work for so long I would probably use the money to pay our bills. Our children have been raised knowing that Jesus is the real reason for the season & were never told anything about Santa. This would be such a blessing this year. My daughter has had two foster children since March who are 2 and 3. These two babies do not even know who Santa is! It would ALL go to make this a magical Christmas. It would help get my family to my Grandmother’s funeral and to see snow for the first time. Thanks for the give-away opportunity! If I won, I would use the money to to help pay off some debt instead of adding to it. We would use the money to plan a few fun family outings this Christmas season. We already do quite a few activities, but a splurge on something we wouldn’t normally do would be fun. So fun! This would be fun to bless my family and more around us with! With $500 I could get something really special for each of my young grandchildren. They are wonderful boys and I love to see their eyes sparkle when they are excited! What great resources! Thank you! We moved recently and money is a little tight as we balance setting up house with the upcoming holiday season. We would use it to pay down debt. We will be using 2019 to get our finances back on track after a costly 2018. I would use half the money for black Friday shopping, and give the other half to my church. Thank you for putting in your time and effort to host this giveaway. What a blessing! What a great giveaway! Thank you! I would use the money to help with a remodel job we’re doing so we have more room for hosting our church group. Wow! This would take care of our Christmas budget! I would use some of the money to buy some new clothes. I’ve lost quite a bit of weight in the last year and have been making do by taking things up but I really need some new clothes at least in the skirt department. I would use some to be a blessing to another family in need. If anything was left I’d probably spend it on whatever was needed in our family. Thanks for this fabulous giveaway! I ALWAYS love the link party. I would use the $500 to pay for classes for our kids next year (swimming and music classes). Hi! With 10 grandchildren to buy for I could sure use this gift! Thanks so much for the chance to win. Finances are very tight this year. I would use the money to buy my seven childen Christmas gifts. Wow! What an AWESOME HUGE gift this would be! I could bless my family in so many ways- food, gifts, books, pay some bills and bless others with some food goodies.Thank you for your kindness shown to whomever is gifted! This would be such a blessing to our family. We would be able to eat and pay some bills and even get Christmas gifts for our grandchildren! My dear husband is not getting much work right now, so this would be a true Godsend. We would be able to eat and pay some bills and even buy some Christmas gifts for our grandchildren! My dear husband is not getting much work lately, so this would be a Godsend. We would finish paying off our debt and be debt free for the new year so we can start my husband’s busniess sooner. This would truly bless our family with all the financial obligations we are overwhelmed with right now. This would truly bless our family with all of the financial obligations we are overwhelmed with right now. Actually, I can’t decide if I would use the $500 to buy gifts for our 8 kids or do a memorable activity with them, or to go towards my cancer treatments. I’m leaning more towards the memorable activity with them. This would be a blessing to our family because my husband lost his job a few weeks ago, and we are struggling. I would spend this money on groceries, with a present for each of my kids. Thank you! This money would bless us greatly this year, as money is a little tighter than usual. What a blessing this could be! It would be used for an unexpected hospital bill we have. Thank you! What a great giveaway and I love your web page. This has been a tough year financially and I’ve been wondering how to get Christmas gifts for the children (we have 8). Thanks for this awesome giveaway. I would use the money for Christmas gifts. 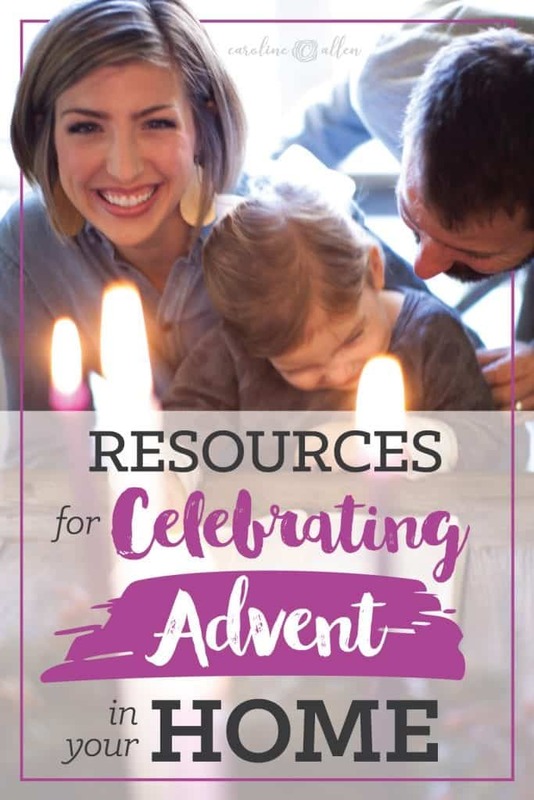 These Advent ideas look really good. I like that there are so many to choose from. Thank you for the giveaway. It will be quite a blessing to whomever gets chosen. If I won, then the $500 would be split to purchase baby supplies for our 5th, and help fund our upstairs remodel. we currently have all 4 kids in a big bedroom down stairs, and they would like to spread out. This would be such an amazing blessing. This would be such a blessing. I’d split between gifts and getting oil for the furnace. I would put the money toward a mini vacation for when my husband returns from deployment / before my son enlists in the military. This would be a blessing to catch up on some bills and buy a little bit of gifts still needed. We are a very frugal family, so having some “extra” to give this Christmas would be such a blessing, to talk about, decide what to give and to whom, etc. Wow! What a great giveaway! If I won, I would use it to help pay travel expenses for visiting family for Christmas. Wow! I’m so excited about this giveaway. $500 would be such a huge blessing to us! This would be a huge blessing and allow us to have Christmas. I would use it towards a used vehicle to fit our family. This would be an incredible blessing! I love the season of Advent. There is so much to teach and I am grateful for the resource ideas you have included. Thank you for the time and effort! Also, a $500 blessing would be substantial to us. Thank you for hosting such a generous giveaway. If we won the $500 we would put it towards paying down medical expenses for our baby girl who is due in April. Five hundred dollars would get us enough groceries for a fantastic home-cooked Christmas dinner for the whole family. $500 would get us through Christmas gift-giving and celebrations with less stress! Thanks for doing this giveaway! We have 8 kids (3 of them with December birthdays!) and Christmas coming up next month, in addition to our yearly vehicle property tax bill which is almost $1650 (and I forgot it was going to be that big!) So even the idea of winning is exciting! LOL. Happy Thanksgiving (and Blessed Advent!) to you all! This would be awesome to win. This is my first Christmas trying to really stick within a budget. Every little bit helps. We can’t even afford a tree, so to say this would be a blessing is an understatement. My daughter’s birthday is in December too. I’m afraid all she’ll get is a cake. With 9 children, Christmas is always tight. Gifts and treats are certainly not the reason for the season but it’s still hard to feel like you can’t give your kids a special Christmas season. A little extra spending money would certainly help us and we could even bless someone else in some way! Merry Christmas! Thanks for the giveaway! I think we’d put the cash towards fixing out bathroom. We have to replace the shower, but we’d love to get rid of the nasty vanity too! First, I would buy the kids’ curriculum for next year. Then, I would catch up all of our past due bills so that they would stop calling my husband at work. If there was any left over, I would like to buy him a new pair of shoes for work. He stands and walks all day and wears through his shoes quickly. This is exciting! What a blessing! If I won I would use the money to make more holiday memories by going on festive outings and also get outdoor gear for my kids because they like to play in all weather. What a generous giveaway! This would help us buy gifts for our family and catch up on some bills. We would pay a bill that is very behind. Winning this would be amazing. $500 would go to at of things, gifts and acctivies for our family.